Jed Dixon, Micah Cone, Heather Dixon, Tina Marie Kelley and Kim Wellman lend their talents to Off Broadstreet’s "Heartland Holiday." Since 1989 Off Broadstreet has been Nevada City’s answer to the The Great White Way. 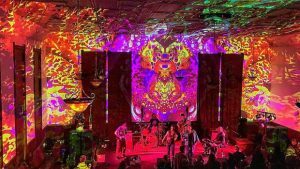 Lovingly referred to as a dinner-less theatre (their menu offerings include dessert and drinks), Off Broadstreet has seen a variety of shows grace its intimate stage, all of which have been written by co-owners Jan Kopp and John Driscoll. 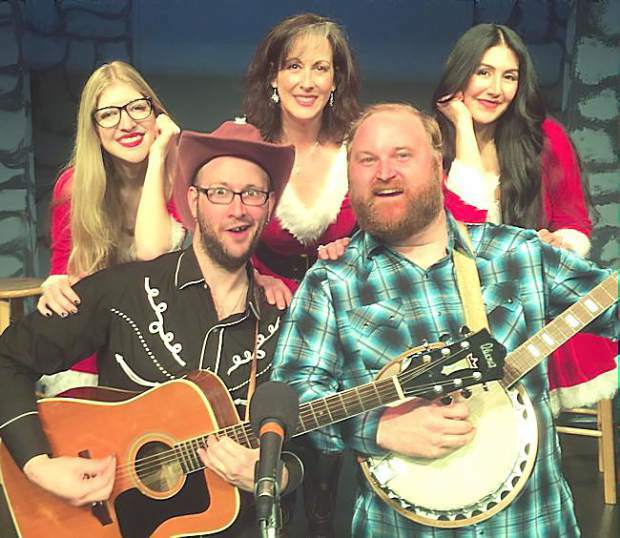 This holiday season the company is celebrating with their original production of “Heartland Holiday,” a musical comedy review that incorporates beloved tunes audiences will undoubtedly recognize. The show tells the story of a small-town radio station whose staff hopes they can spread cheer and a message of unity through their Christmas Eve broadcast. The show is so popular, in fact, that each of its 14 showings is completely sold out. Driscoll confirmed that a waiting list is open for anyone hoping to catch the performance before its run ends on Dec. 23. The play tells the story of the underdog Holly Miller who keeps trying to become famous, and like “Heartland Holiday,” it features some of the most popular music from the last half of the twentieth century. The overall lively feeling one has when attending an Off Broadstreet is no accident. Driscoll said there are many reasons to experience a night out at Off Broadstreet, during the holidays and beyond. The story of Ebenezer Scrooge and the ghosts who visit him on Christmas Eve has been adapted in a myriad of ways, and LeGacy Presents’ version of the classic Dickens tale — aptly called “Scrooge” — is but one of them. Taking over the historic Nevada Theatre for much of December, the show is directed by the company’s founder, Sue LeGate-Halford who says there are a number of factors that set their production apart from the others. Readers and audiences have been fascinated by “A Christmas Carol” since Dickens published the work for the first time in 1843. LeGate-Halford explains that at its heart, Scrooge is a tale of redemption. Audiences get a special glimpse into the production as the actors line up after each performance to greet attendees. LeGacy is enthusiastic that as many people as possible have access to their productions, even partnering with Big Brothers/Big Sisters to offer tickets to kids who may not otherwise have the opportunity to attend. Their outreach extends to several local schools, whose students are invited in for a special matinee. LeGate-Halford is proud of her company, explaining that the hard work that goes into Scrooge is a labor of love. Scrooge will run through Christmas Eve.